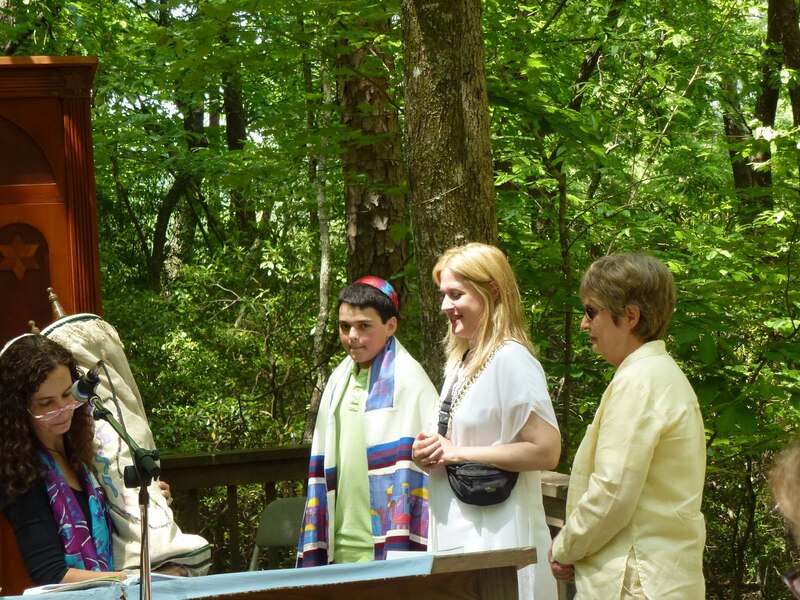 In late May I joined members of my family at the Bar Mitzvah of my great-nephew, Max Harris. I've attended other family Bar and Bat Mitzvahs and have shared the pleasure of the families watching their children experience this significant milestone. Yet I have typically looked upon most religious rituals with some cynicism. It was different this time. This was unique and joyful. 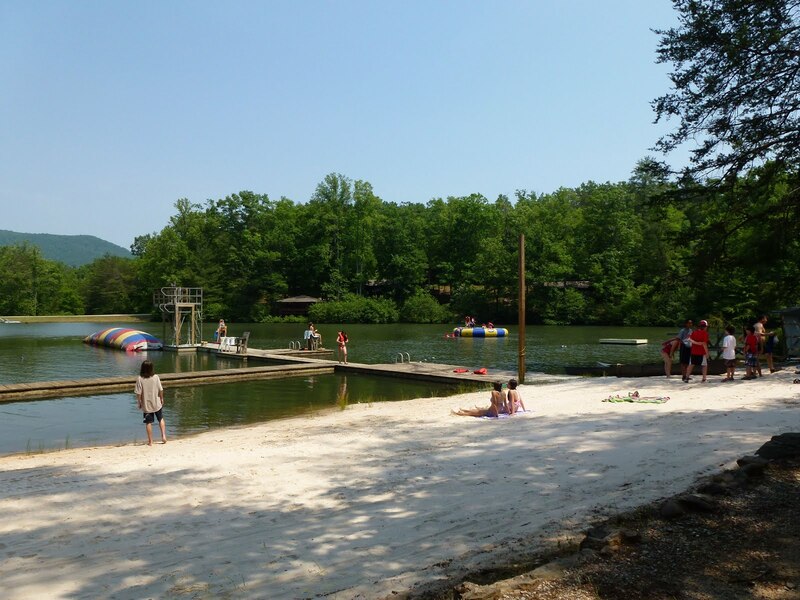 When my nephew Bobby told me that his son wanted to have his Bar Mitzvah at Camp Coleman in Cleveland, Georgia, where Bobby is Camp Director, I had many misgivings as I anticipated the physical discomforts of camp life and a difficult drive to get there from the Atlanta airport. I remembered a family reunion at a camp near Pittsburgh where the heat was stifling and several people were crowded into cramped cabins. The weekend of the event promised lovely weather. My brother, my son and daughter-in-law arranged to meet me at the rental car booth connected to the Atlanta airport. Most of the drive was unnerving, even though my brother did the driving. 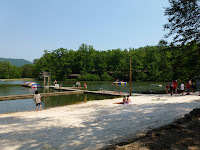 When Bobby welcomed us as we pulled up to the camp office, the first happy surprise was the size of the camp, its natural beauty, the lake and trees, and the variety of facilities. The many winding roads to cabins spread out over a large area of wooded terrain offered a sense of privacy. Bobby and wife Ellen had obviously devoted a great deal of attention to the assignment of accommodations for their guests. My room in the health center was large, private, comfortable, and convenient to all activities. 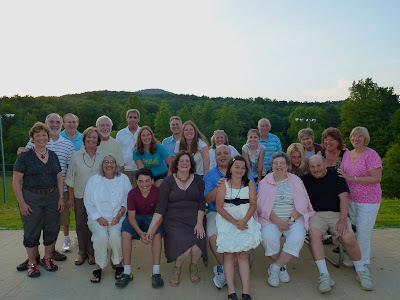 As other family members and friends arrived, the atmosphere became even more relaxed. Bobby and Ellen made sure everyone knew that this was camp and dress was informal. 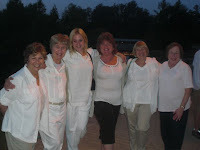 They had alerted us in advance that for Friday night’s Shabbat dinner, people at camp typically wore white if they could. Everyone tried to comply, but otherwise it was casual and comfortable, with little concern by anyone about how we looked. 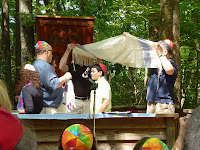 After the prayers to welcome the Sabbath and the buffet dinner, we gathered outside under the stars and around the campfire while a rabbi told stories and the cantor played the guitar to lead group singing. I could feel the tension of the past weeks lifting. There were funny moments that made me think of what comments my mother would have made if she had lived to attend this event. I know she would have been thrilled to be surrounded by so many of her family members. 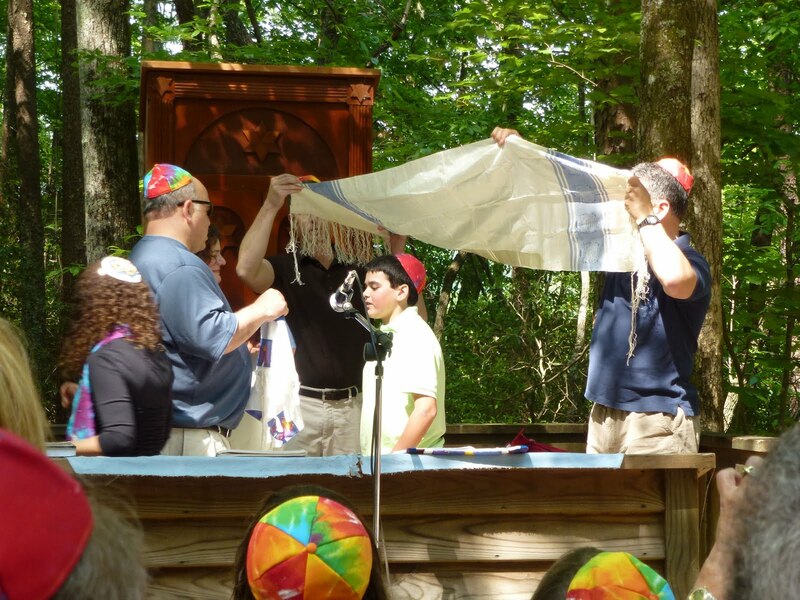 The actual Bar Mitzvah took place on Saturday morning in an outdoor chapel surrounded by tall trees glistening from the sunshine. Before Max was called to read from the Torah, he sat in front of the congregation drumming to the musical prayers. Bobby and Ellen each spoke of their love for Max and the meaning this milestone in his life had for them. 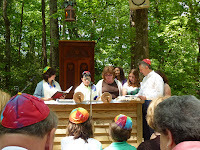 Various family members were called to read passages from the Torah. Max did a superb job with his reading and speech. His younger sister Sophie also read a prayer with great confidence and skill. 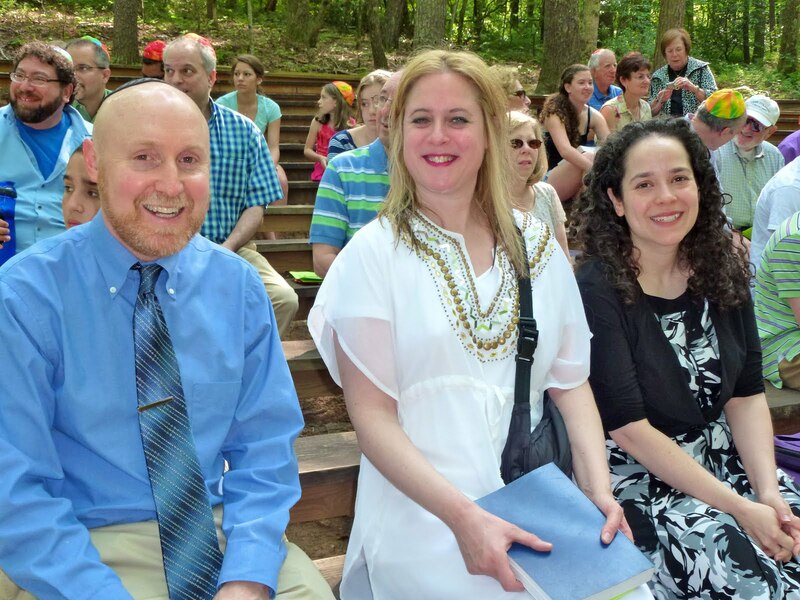 My daughter Lisa and I had the honor of opening the ark together. 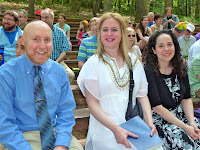 Throughout the service I realized how connected I felt being part of this experience with close family members, especially when Bobby’s sister Cheryl and her family stood together reading their Hebrew passage. I thought about Bobby and Cheryl’s mother…my sister Corrine…who had passed away several years ago. The spirit of her loving kindness and warm smile seemed to pervade the atmosphere. I thought about Morley…my sister’s husband…who died less than two years ago and how proud he was of his children and grandchildren. I felt that they were both a part of this ceremony. I looked at the trees and the sky and realized that not only did this event combine ancient ritual with modern practices, but the setting brought nature and family together, creating a truly spiritual experience.